To commit autohagiography is to write about oneself in an adulatory way. It has the same relationship to autobiography as a publicist’s puffery has to objective truth. So far as I know it hasn’t yet reached the pages of any major dictionary, being one of those words that lurks unnoticed in the linguistic undergrowth, only occasionally emerging to startle the unwary reader. 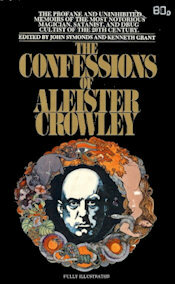 The first use of it I can trace is in the title of the book The Confessions of Aleister Crowley; An Autohagiography, which was published in 1970. I’ve also seen the adjective autohagiographical, but it seems to be rare to the point where it is reinvented each time it’s used. The root word hagiography comes from the Greek agios, “holy”, and was at first applied to books which described the lives of the saints. Such books had a marked tendency towards uncritical descriptions. So sometime about the end of last century hagiography broadened its sense to that of any biographical work that flatters or idolises its subject.